Brody Sweeney, the founder of Camile Thai Kitchen. With 20 restaurants and counting, Camile Thai is thriving in its niche as a healthy online delivery restaurant. With a food product that is perfectly tailored to holding its heat and quality during delivery, as well as providing high-end user experience, the brand is positioned well to reach its target market of time-poor, cuisine-curious young urban professionals. 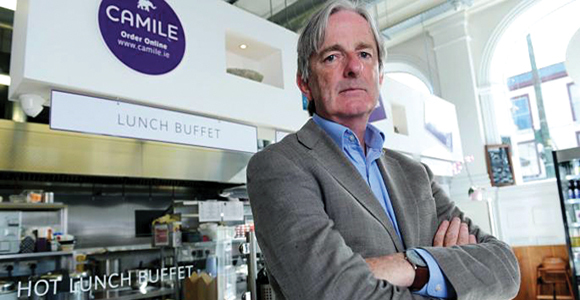 Since opening in Dublin in 2011, the business has expanded substantially through a combination of company-owned and franchised restaurants. Now, having already opened company-owned restaurants in Tooting Bec, Clapham and Bermondsey, Camile Thai is looking to expand its franchise component in the London market. The food delivery market has exploded in the last five years, experiencing a 50 per cent growth over that time period. In the last six months alone, the number of consumers ordering delivery has risen from 31 per cent to 36 per cent, with much of that focused on an urban professional segment. With all of this growth, the food delivery sector lags well behind other delivery focused business types, suggesting more room for growth. A tremendous opportunity for expansion emerges for a food business as well set up for home delivery as Camile Thai. While market opportunity is one element to success, standing out in a marketplace with increased competition is another. With that in mind, Camile Thai has built a brand that resonates strongly with its core target market. Camile Thai is uniquely positioned as a healthy hot Asian food brand, with calorie counts on all dishes as catering to diets of gluten free, dairy free and vegan customers. Another key component of Camile Thai is their keen understanding of delivery logistics compared to many of their competitors. For many restaurant brands, the delivery market is an added bonus to their main business – a way to add incremental sales to their existing model. For Camile Thai, home delivery has remained the focus since it was founded. Because of this, every subsequent innovation has focused on improving this area of the business. In the past year, Camile Thai has introduced new compostable packaging that is developed to retain their food’s heat and quality, introduced new tools to measure delivery efficiency, and built a bespoke online ordering system and native application to ensure ease of at home ordering for the consumer and better data mining for its marketing purposes. Camile Thai has consistently won awards for Best Thai and Healthiest Takeaway over the years within the Irish market. It now aims to expand that experiences farther across its London segment. At Camile Thai, prospective franchisees will find the opportunity to join a unique thriving food delivery brand in a booming market with incredible opportunity for growth.